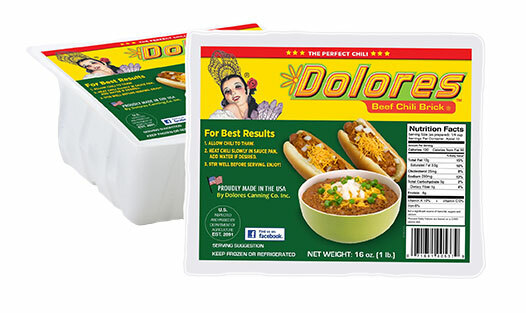 Dolores chili is now available in all Southern California and Arizona WinCo’s. Dolores Chili Brick® is being sold at all Southern California and Arizona WinCo grocery stores. “We are very excited about our partnership with the great people at WinCo Foods and we look forward to having our Dolores Chili available to WinCo customers,” said David Muñoz, Dolores Canning President. The 16-ounce retail-sized Chili Brick® can be found in the fresh meat case and each brick is sold ready to heat and serve, and makes four servings. It can be eaten as is, with the additions of your favorite toppings like cheese or onions, and even as a topping to your burger or hot dog. WinCo Foods, Inc. is an American supermarket chain based in Boise, Idaho with retail stores in Arizona, California, Idaho, Nevada, Oregon, Utah, Washington, and Texas. As of March 2014, they have 93 retail stores nation-wide. Dolores Chili is made at Dolores Canning Co., which operates out of its East Los Angeles plant, and is a Hispanic family-owned business.